begun and held at the City of New York on Wednesday the fourth of March one thousand seven hundred and eighty nine. SEC. 14. 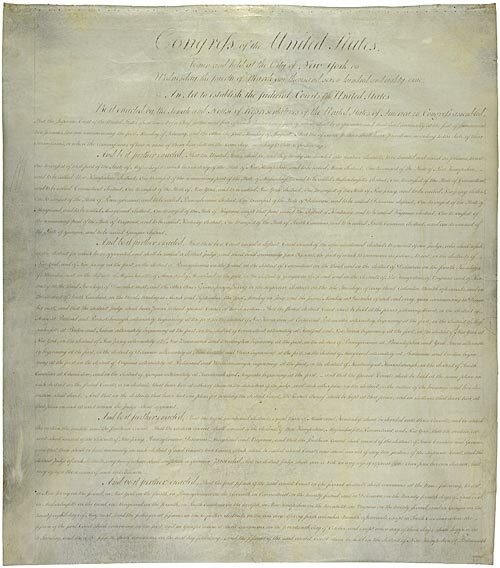 And be it further enacted, That all the before-mentioned courts of the United States, shall have power to issue writs of scire facias, habeas corpus, and all other writs not specially provided for by statute, which may be necessary for the exercise of their respective jurisdictions, and agreeable to the principles and usages of law. And that either of the justices of the supreme court, as well as judges of the district courts, shall have power to grant writs of habeas corpus for the purpose of an inquiry into the cause of commitment. Provided, That writs of habeas corpus shall in no case extend to prisoners in gaol, unless where they are in custody, under or by colour of the authority of the United States, or are committed for trial before some court of the same, or are necessary to be brought into court to testify. SEC. 18. And be it further enacted, That when in a circuit court, judgment upon a verdict in a civil action shall be entered, execution may on motion of either party, at the discretion of the court, and on such conditions for the security of the adverse party as they may judge proper, be stayed forty-two days from the time of entering judgment, to give time to file in the clerks office of said court, a petition for a new trial. And if such petition be there filed within said term of forty-two days, with a certificate thereon from either of the judges of such court, that he allows the same to be filed, which certificate he may make or refuse at his discretion, execution shall of course be further stayed to the next session of said court. And if a new trial be granted, the former judgment shall be thereby rendered void. SEC . 19. And be it further enacted, That it shall be the duty of circuit courts, in causes in equity and of admiralty and maritime jurisdiction, to cause the facts on which they found their sentence or decree, fully to appear upon the record either from the pleadings and decree itself, or a state of the case agreed by the parties, or their counsel, or if they disagree by a stating of the case by the court. SEC. 22. And be it further enacted, That final decrees and judgments in civil actions in a district court, where the matter in dispute exceeds the sum or value of fifty dollars, exclusive of costs, may be reexamined, and reversed or affirmed in a circuit court, holden in the same district, upon a writ of error, whereto shall be annexed and returned therewith at the day and place therein mentioned, an authenticated transcript of the record, an assignment of errors, and prayer for reversal, with a citation to the adverse party, signed by the judge of such district court, or a justice of the Supreme Court, the adverse party having at least twenty days notice. And upon a like process, may final judgments and decrees in civil actions, and suits in equity in a circuit court, brought there by original process, or removed there from courts of the several States, or removed there by appeal from a district court where the matter in dispute exceeds the sum or value of two thousand dollars, exclusive of costs, be re-examined and reversed or affirmed in the Supreme Court, the citation being in such case signed by a judge of such circuit court, or justice of the Supreme Court, and the adverse party having at least thirty days notice. But there shall be no reversal in either court on such writ of error for error in ruling any plea in abatement, other than a plea to the jurisdiction of the court, or such plea to a petition or bill in equity, as is in the nature of a demurrer, or for any error in fact. And writs of error shall not be brought but within five years after rendering or passing the judgment or decree complained of, or in case the person entitled to such writ of error be an infant, feme covert, non compos mentis, or imprisoned, then within five years as aforesaid, exclusive of the time of such disability. And every justice or judge signing a citation on any writ of error as aforesaid, shall take good and sufficient security, that the plaintiff in error shall prosecute his writ to effect, and answer all damages and costs if he fail to make his plea good. SEC. 23. And be it further enacted, That a writ of error as aforesaid shall be a supersedeas and stay execution in cases only where the writ of error is served, by a copy thereof being lodged for the adverse party in the clerks office where the record remains, within ten days, Sundays exclusive, after rendering the judgment or passing the decree complained of. Until the expiration of which term of ten days, executions shall not issue in any case where a writ of error may be a supersedeas; and whereupon such writ of error the Supreme or a circuit court shall affirm a judgment or decree, they shall adjudge or decree to the respondent in error just damages for his delay, and single or double costs at their discretion. under the authority of the United States, and true returns make, and in all things well and truly, and without malice or partiality, perform the duties of the office of marshal (or marshals deputy, as the case may be) of the district of , during my continuance in said office, and take only my lawful fees. So help me God." SEC. 29. And be it further enacted, That in cases punishable with death, the trial shall be had in the county where the offence was committed, or where that cannot be done without great inconvenience, twelve petit jurors at least shall be summoned from thence. And jurors in all cases to serve in the courts of the United States shall be designated by lot or otherwise in each State respectively according to the mode of forming juries therein now practised, so far as the laws of the same shall render such designation practicable by the courts or marshals of the United States; and the jurors shall have the same qualifications as are requisite for jurors by the laws of the State of which they are citizens, to serve in the highest courts of law of such State, and shall be returned as there shall be occasion for them, from such parts of the district from time to time as the court shall direct, so as shall be most favourable to an impartial trial, and so as not to incur an unnecessary expense, or unduly to burthen the citizens of any part of the district with such services. And writs of venire facias when directed by the court shall issue from the clerks office, and shall be served and returned by the marshal in his proper person, or by his deputy, or in case the marshal or his deputy is not an indifferent person, or is interested in the event of the cause, by such fit person as the court shall specially appoint for that purpose, to whom they shall administer an oath or affirmation that he will truly and impartially serve and return such writ. And when from challenges or otherwise there shall not be a jury to determine any civil or criminal cause, the marshal or his deputy shall, by order of the court where such defect of jurors shall happen, return jurymen de talibus circumstantibus sufficient to complete the pannel; and when the marshal or his deputy are disqualified as aforesaid, jurors may be returned by such disinterested person as the court shall appoint. SEC. 33. 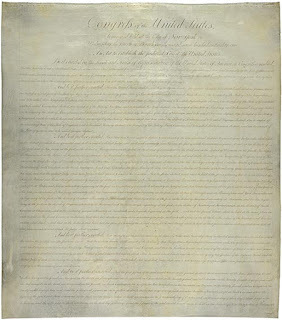 And be it further enacted, That for any crime or offence against the United States, the offender may, by any justice or judge of the United States, or by any justice of the peace, or other magistrate of any of the United States where he may be found agreeably to the usual mode of process against offenders in such state, and at the expense of the United States, be arrested, and imprisoned or bailed, as the case may be, for trial before such court of the United States as by this act has cognizance of the offence. And copies of the process shall be returned as speedily as may be into the clerks office of such court, together with the recognizances of the witnesses for their appearance to testify in the case; which recognizances the magistrate before whom the examination shall be, may require on pain of imprisonment. And if such commitment of the offender, or the witnesses shall be in a district other than that in which the offence is to be tried, it shall be the duty of the judge of that district where the delinquent is imprisoned, seasonably to issue, and of the marshal of the same district to execute, a warrant for the removal of the offender, and the witnesses, or either of them, as the case may be, to the district in which the trial is to be had. And upon all arrests in criminal cases, bail shall be admitted, except where the punishment may be death, in which cases it shall not be admitted but by the supreme or a circuit court, or by a justice of the supreme court, or a judge of a district court, who shall exercise their discretion therein, regarding the nature and circumstances of the offence, and of the evidence, and the usages of law. And if a person committed by a justice of the supreme or a judge of a district court for an offence not punishable with death, shall afterwards procure bail, and there be no judge of the United States in the district to take the same, it may be taken by any judge of the supreme or superior court of law of such state. APPROVED, September the Twenty fourth, 1789.